2PM's Taecyeon made headlines when he was accepted in to Korea University's School of International Studies and earned praise from fans and the public initially, but it has now been reported that contrary to popular belief, he hasn't been attending his classes. He'd previously said, "I wondered what it'd be like if I helped use the influence I have as part of 2PM internationally in a good way, so I decided on that major. I might not be a scholar, but It's something I want to try. I'm going to work hard so that I can become an ambassador of peace." Even though some articles had reported that Taecyeon was diligently attending classes, asking an actual student at the School of International Studies revealed that Taecyeon had yet to attend his classes. In one of the attendance lists for Taeceyon's class, it shows Taecyeon had never been to class since the beginning of the semester and the professor seems to have given up on marking Taecyeon's absence after a while. One student who was in 5 of Taecyeon's classes said that he'd seen Taecyeon once during the entire semester, leading netizens to wonder whether that means he also hasn't handed in necessary reports nor taken the midterms and finals. Korea University's School of International Studies said, "By school rules, a student get an F is he is absent for more than 1/6th of the classes. However, there is a portion where the professor can give his own opinions for a grade. 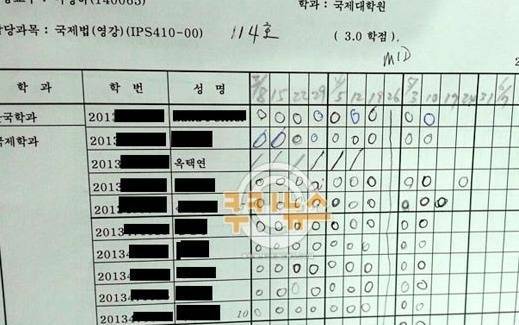 Even though Taecyeon registered, he missed his classes, so he probably hasn't received grades. It's difficult for him to expect grades if he's not coming to any classes." In response to the report, netizens have been voicing various opinions that range from criticizing celebrities who use their status and image to be accepted into the school only to not attend in the end, to reasoning that Taecyeon was probably too busy with 2PM promotions lately to attend and should be given a chance to explain. Taecyeon graduated from Dankook University with a degree in business administration and was accepted into Korea University Graduate School of International Studies.